A mother-of-two fears her UKIP candidate ex-husband is “brainwashing” her children into becoming racist and homophobic. The mother claims her ex-husband, who cannot be named for legal reasons, is “abusing their childhood” by “pumping them full” of UKIP beliefs. She claims “99.9 percent of parents” believe children should not be involved in politics. The father encourages his children to distribute UKIP leaflets and promote the party when spending time with him. Their mother says it is “mentally challenging” for her children to face UKIP opposition, as one of them once had a leaflet ripped up in their face and another had an egg thrown at them while campaigning. One of the children is already a member of UKIP’s youth wing and another is determined to join. “They shouldn’t know what they are talking about because none of them at that age should know anything to do with politics,” the mother argued. In a poll on Debate Wise, one user commented on the UKIP candidate’s inclusion of his children in campaigning. “It will help young people to elect the right candidate and they will learn the importance of voting,” they said. However, one Twitter user said it is “wrong to push politics on children,” adding she would even be against anti-UKIP ideas being taught. #UKIP policy to teach all children to "take pride in the British Empire"- not think critically and objetively. That is actual brainwashing! 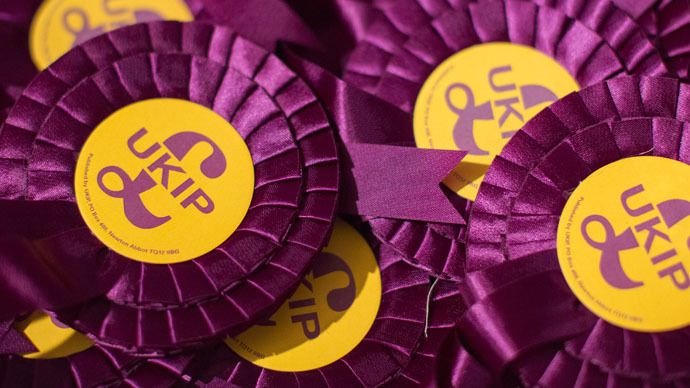 The UKIP hopeful father accused his ex-wife of “indoctrinating” the children. “This is a victory. People are fed of up being told how they are supposed to think,” the father said. “Even if my children had picked up racism, which I do not accept they have, they have not picked it up from UKIP,” he added.